I had the pleasure of spending a couple of days exploring Quebec City in Canada recently and it nearly wasn’t enough time; I could have happily lived like a local for months on end. Known as the crown jewel of French Canada, Quebec City is one of North America’s oldest and most stunning settlements and an absolute must see on your Canadian itinerary. So here are my top 12 reasons to visit Quebec City. 2. Quebec produces over 75% of the world’s supply of maple syrup, and for good reason – it’s super delicious. It’s heralded in Quebec City and you will find many chefs including maple syrup in their menus. 3. Quebec City is the only walled city in North America so walk or jog the 4.6km circuit at your own pace. It’s the best place to start when you are exploring the city. 4. Get lost amongst the plethora of amazing restaurants and take a walking food inspired tour around the city and the historic citadel. Classic bistros, sidewalk cafes and fancy restaurants will entertain even the most discerning foodie for days. 5. Stay in a hotel overlooking the St Lawrence River. The very gran Fairmont Chateau Frontenac is popular, however I stayed at the boutique Hotel des Coutellier, which I adored for its service and central location. 6. A visit to Quebec City isn’t complete without trying the ‘real’ poutine, with pulled pork, French Fries and lots of melted cheese. The best I had were at Restaurant SSS. If you are looking to buy local produce then a visit to the Marche du Vieux-Port is an absolute must. It’s a farmers market down the by the river and is a nice alternative to the many café and restaurants dotting the cobblestone streets; the crepes are heavenly, the brie is mouth watering and ask a local where the hot dog stand is, you won’t be disappointed. 7. Cirque du Soleil co-founder Daniel Gauthier is the founder of Le Massif de Charlevoix’s train. Travelling 140km from Quebec City at the beautiful Montmorency Falls Park along the banks of St Lawrence to the picturesque Charlervoix town of Baie-St-Paul, this train trip can easily be done in a day. 8. Quebec City is compact and small, so it’s super easy to walk around on foot all day and not feel tired. 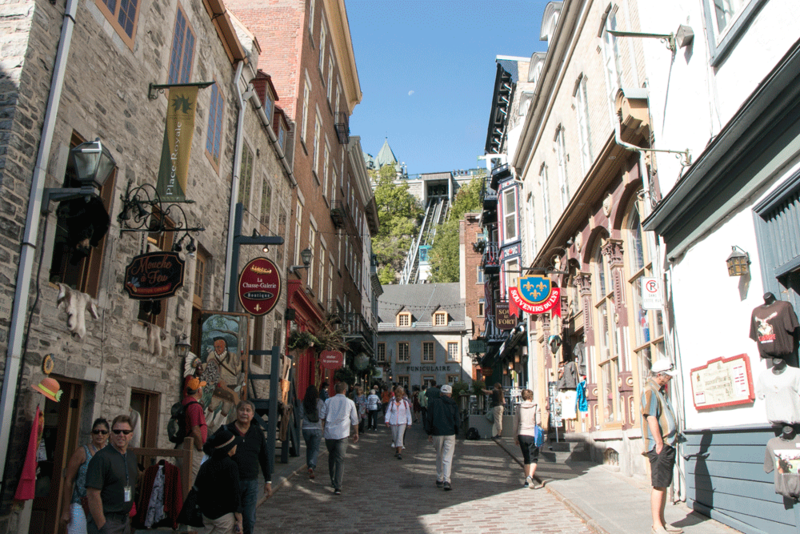 However when it’s too much to tackle many of the city’s steep streets, meander between Old Upper Town and Old Lower Town via the Funiculaire du Vieux-Quebec, which has been around since 1879. 9. Take a scenic stroll through Battlefields Park overlooking the St Lawrence River; it’s the city’s centerpiece of 103 hectares of lush grassy meadows. 10. If you’re looking for a bit of action and adventure, you can’t visit Quebec City without going on the thrilling zipline at Canyon Sainte-Anne. 11. If you don’t have a lot of time, the best way to explore Quebec City is by the hop on hop off Le Bus Rouge. Try and get a seat up the top so you can take 360-degree photos! 12. If the only reason you want to visit is for the cheese curds, then we can be friends for life.